You’ll find a printable version of this recipe at www.susanmallery.com/recipes.php. Since I started this cooking blog last year, I have begun to follow other blogs that share free recipes online. There are a lot of very talented cooks in the world… and many of them are also very talented photographers. Sadly, my pictures don’t do my recipes justice. Unfortunately, I hit a stumbling block with the first and second tips. The first is to turn off the flash, and the second is to rely instead upon natural light for the food pictures. The problem is, this time of year, the sun goes down in Seattle before 5 pm, and I don’t start cooking until after I finish my writing for the day. And even when the sun is up, we don’t see it very often in this cloudy city. I create recipes as a way to connect with readers, but I think most of my readers would prefer that I spend my best, most creative hours writing the books they love. But for this recipe, because the meat would benefit from a few hours to absorb the flavors of the rub, I did do some prep work during daylight hours… with a rare Seattle peek of actual daylight! And I must admit, I love how the garlic cloves look in the natural sunlight. 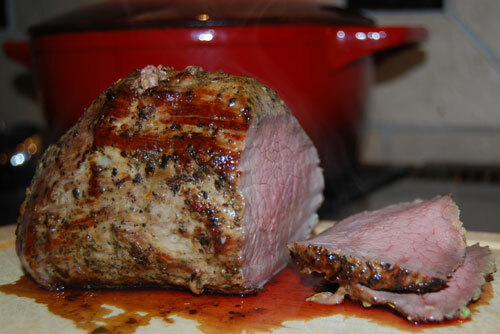 Oh, and by the way, this roast beef tasted amazing. The flavor really didn’t taste much like mint, but it did have a nice little “bite” that was different from the same-old, same-old. 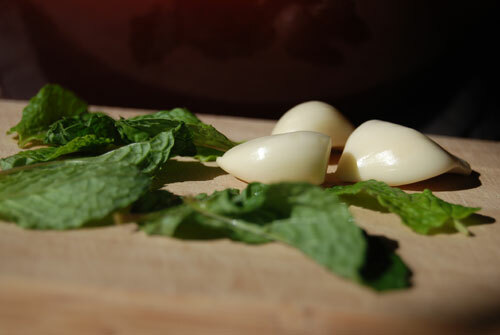 Mince the mint leaves and garlic and place in a small bowl. 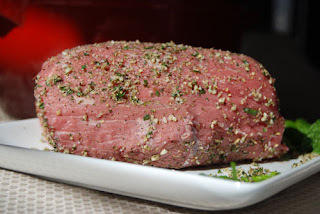 Mix with the oregano, salt, and pepper, then rub over the meat. Place the meat in the refrigerator, uncovered for about two hours. Pre-heat oven to 225 degrees. Heat heavy-bottomed, oven-safe pan on the stovetop over medium-high heat. Add oil. When oil shimmers, put the roast in the pan. Sear on each side for about 2 minutes. Place the pan with the roast in the oven and cook on low heat until the center of the roast reaches about 150 degrees, about 60-90 minutes. Allow the roast to rest for 15 minutes before slicing. This picture was taken with a flash, long after the sun went down. It is! And looking at that picture is making me crave it again. Of course, that could have something to do with this blasted diet that I'm on! What degrees are you using there? 225F to pre-heat or is that Celcius? When you say, cook on low heat, why did you pre-heat the oven then? 150 inner temperature, ok, Farhenheit there, right? Damn, put that one in line or please folks, don't follow those instructions.